On Saturday night, all eyes were on Spike TV as it hosted it’s annual Video Game Awards. Less of an actual award show and more of a huge marketing stunt for multiple publishers, the 2011 VGAs was heavy on the random celebrity appearances and world exclusives but light on awarding achievement. Nevertheless, take the show for what it is – a good place to see new video game content – and this year’s VGAs did promise some exciting new stories. Prior to the show, companies were hyping their fans by claiming new IPs and titles were to be revealed, making us almost forget that Charlie Sheen was handing out an award (yeah, I don’t know either). And with only minutes to go, one of the big stories of the night, that being the future of Metal Gear Solid: Rising was spoilt online with news outlets managing to get early scoops thanks to the trailer leaking. It then became a matter of whether or not the newly born rumours were true. But kicking things off were Sony and Naughty Dog whose world exclusive trailer for brand new IP, The Last of Us, sent people into a frenzy. The graphics, as you expect from such a praised developer, were stunning and later claimed to be running in real time from the PS3 for which this game is destined for. Joel and Ellie, one a middle-aged man and the other a teenage girl, are scavenging what they can from an abandoned house when they’re attacked by humans ravaged with some kind of disease. They look mutated and it’s unknown as to whether they’re zombies in the traditional sense but it sure looks like The Last of Us will fall in the zombie/survival horror genre. The end of video sees the two burst out into the street which over looks a city that has been reclaimed by nature. Think I Am Legend. But if you do, prepare to be flamed in forums because this game is proving quite divisive despite so little details. The optimists are quick to say how it’ll be the greatest thing ever with pessimists firing back with sighs of how it’s just another zombie game, ripping off Will Smith’s 2007 hit. And while I am one of those bored with zombie games who did notice similarities with I Am Legend, the important factor is that it’s being developed by Naughty Dog, a studio proven themselves to be more than capable at delivering a fantastic narrative experience. Despite a promotional campaign suggesting otherwise, Dead Island wound up being just another zombie game so it’s understandable for gamers to be concerned but Naughty Dog certainly are a studio who seriously could change the way we play these types of games. Next up was BioWare who first showed off some more footage from Mass Effect 3 with Shepard and his crew fighting a reaper. It looked very much in-game and a great mix of action and short story sequences that is making the wait between now and March 2012 so much harder. Then came BioWare’s big new game, the next thing to come out of the studio after all this sci-fi shenanigans. And it was a sequel to an existing IP. Command and Conquer Generals 2 is the next instalment of PC real-time strategy warfare coming 2013 (unless the Mayans are right) and the trailer didn’t offer a great deal of info other than it’ll be using the Frostbite 2 engine which currently powers Battlefield 3. So at least we know it’ll look gorgeous. I’m sure RTS fans were delighted but I was a bit disappointed, not being a fan of the genre. I wasn’t expecting any particular title from BioWare but am a little surprised that they’re taking on an RTS. I presume EA are hoping the Canadian developers can sprinkle a bit of their magic onto a once forgotten off shoot of a franchise, bringing it back to profitable status. I do worry that EA are relying on BioWare a bit too much and wonder what other types of games will we be seeing in the years to come from a company whose strengths lie elsewhere. But who knows, the RTS genre could be a perfect fit for them. The next game that caught my eye was Alan Wake’s American Nightmare, a downloadable action adventure game first mentioned back in May. Then it had no name but was definitely not Alan Wake 2 and from the looks of it, this isn’t. In AWAN, Wake is fighting against his evil double, Mr. Scratch, who is after his wife. Naturally, Wake isn’t too pleased at the idea so must stop him using the same combat mechanics as the first game where you shine light onto enemies to burn off the evil, then blow them away with a firearm. Mechanics that I really enjoyed and am really pleased are making a come back. It looks as if Remedy are taking things less seriously with this game and adding in easier to follow storyline too. The other thing about this game is how its an Arcade title instead of store release and so hopefully will be less of a financial risk for Microsoft who could of easily buried any chance of extending the franchise after the original game didn’t sell as well as it should have. 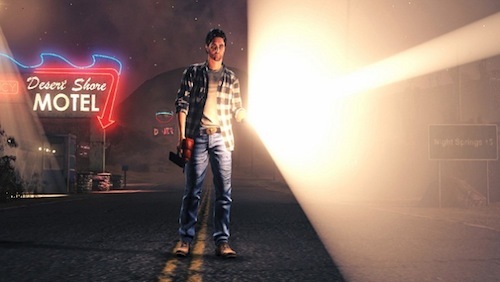 Alan Wake’s American Nightmare is coming early next year. Epic announced their new game and did prefix the reveal with how it’ll be something entirely new and different from the studio. And it sure did look it. With Epic and its Unreal Engine, a certain art-style is expected but Cliff Bleszinski took to the stage of the VGAs and showed Fortnite, a cartoonish, tower defence shooter where the key is to survive. From the video showing teenage-looking kids rooting around old buildings for scrap, there’ll be a day and night cycle with the day dedicate to strengthening and building your fortress and the night spent fighting off zombies (yep, zombies). Could be interesting but tower defence and/or fortress management never quite appealed to me as it has for many others. It’s good to see Epic expanding on the fortress mechanic from Gears of War 3 however and even better that the art-style is so dramatically different for them. The show was full of other games with the awards bunched together in montages and respectable heads of studios being T-bagged on stage by a dude in an army costume but the game that closed the show is what I’ll end this piece with. No one was sure what had happened to Metal Gear Solid: Rising after its E3 2010 showing. Konami and Kojima hadn’t said a great deal about it with many suspecting it had been canceled. Which was true, according to Andriasang but that clearly didn’t last long because the game has now been given a different title of Metal Gear Rising: Revengeance. Gone is the Solid and storyline set between MGS2 and 4 with Revengeance now taking place after the fourth game. Platinum Games are in charge of development and Hideo Kojima will produce so expect the absurdity of Kojima’s stories and frantic action from a team who gave us Bayonetta and Vanquish. Cosmetically, Revengeance looks more like a Platinum title and moves in much the same way. Stealth is to be replaced with balls to the wall action too making the game the kind of thing fans joked about after MGS4 was released. Back in 2008, we saw Raiden change from the dorky pretty-boy of Metal Gear Solid 2 to the ultimate badass that everyone wanted to play. And soon, I heard more and more people say how cool it would be play an action game featuring the cyborg ninja. Bizarrely, in order to get that, an MGS game had to be canceled and reborn as something else. Still, I cannot wait. This entry was posted in Commentary, Microsoft, Musings, News, Nintendo, PC, PS3, Retro gaming, Sony, Thoughts, Wii, Xbox 360 and tagged Alan Wake's American Nightmare, Bayonetta, BioWare, Cliff Bleszinski, Command and Conquer Generals 2, EA, Epic games, Gears of War 3, Hideo Kojima, Konami, Mass Effect 3, Metal Gear Rising: Revengeance, Metal Gear Solid 4, Naughty Dog, Platinum Games, The Last of Us, Vanquish by HootyMcBoob. Bookmark the permalink.